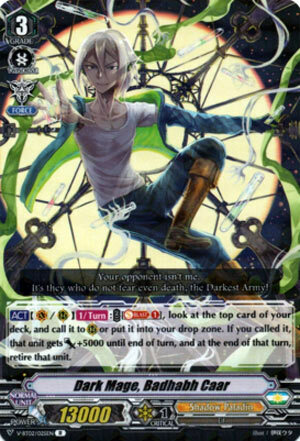 [ACT](VC/RC)1/Turn:COST [Soul Blast (1)], look at the top card of your deck, and call it to (RC) or put it into your drop zone. If you called it, that unit gets [Power]+5000 until end of turn, and at the end of that turn, retire that unit. Woe betide those who ride this, but as for a means to generate fodder for Phantom Blaster Dragon, this is one of the keys. Too much in here that isn’t Nemain that doesn’t cost Counterblast to minimise Phantom Blaster Dragon’s heavy cost, and honestly, that’s how it should be: if you’re using this card’s skill spending resources for RANDOM advantage you don’t even keep and translate into something else you are BAD.